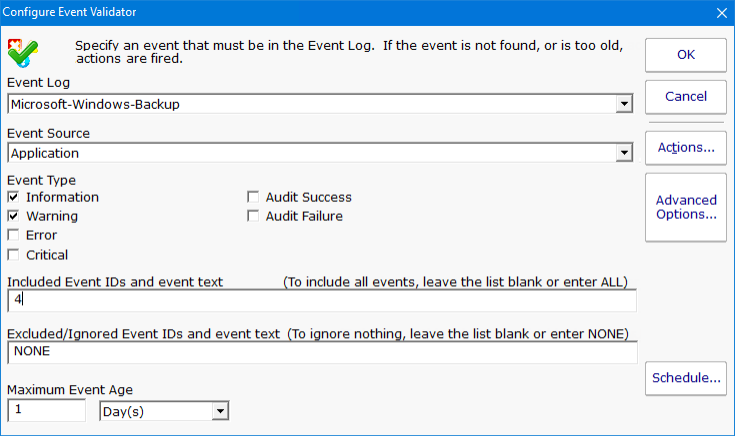 The Event Log Monitor is great for watching for errors and alerting you when they happen. But in common cases like Backup monitoring, or monitoring anti-virus pattern file updates, you want to be notified if a specified event does NOT happen. That is what the Event Validator monitor is for. The screenshot below is from a backup monitor. It is watching for a successful Windows Backup event. In this example, the backup should happen once per day, so the monitor is checking to ensure there is an event with Event ID 4 from the Microsoft-Windows-Backup source. If the event is not found from within the past day, it would indicate the backup either failed, or didn't run at all. In this case, the monitor will fire alerts. The monitor can run as often as you like. By default it checks once per day. That can be changed with the Schedule button in the lower right corner. The Event Validator monitor stores events in the same database as the Event Log monitor. That means the Event Log monitor's report is where you can find out about events that the Event Validator sees.